The XYZprinting da Vinci Mini is perhaps the best budget 3D printer on the market. 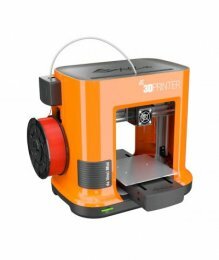 Retailing at about £230 it is one of the most affordable ways to get into 3D printing, and also the easiest, thanks to an easy-to-use interface. And despite being a budget model, it produces good results, and the 3D printed objects it creates are very impressive considering the price - and size - of this 3D printer. The XYZprinting da Vinci Mini is an compact printer that makes it easy to store in an office or on a desk.